Three brilliant stars form this stellar right triangle making it our best heavenly landmark in the August night sky. Vega high above and its western point appears the brightest of the three. Deneb, also high above and to the east of Vega, appears the dimmest. Altair shines below in the south, forming the most distant point of this great triad. These three stunning stars are an unofficial star group or asterism that link the three constellations ... Lyra, Cygnus the Swan and Aquila the Eagle. 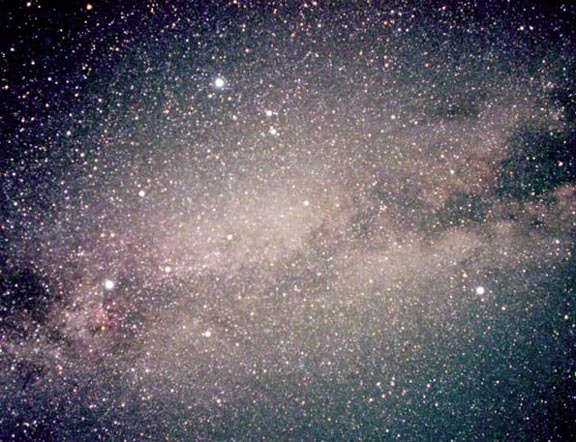 This Summer Triangle lies high above, over the Milky Way which now sweeps across the heavens from north to south. When one ponders upon this heavenly trinity, a transformational gateway appears. The qualities of this gateway, when personally activated lead one on the path of the gods to divine unity. Note: This graphic does not show the Milky Way, which sweeps through the Summer Triangle from Cassiopeia in the northeast to Scorpius in the southwest. The little green cross marks the zenith, the midpoint between the eastern and western horizons. The Summer Triangle formed by the stars Vega, Deneb and Altair is outlined in yellow. 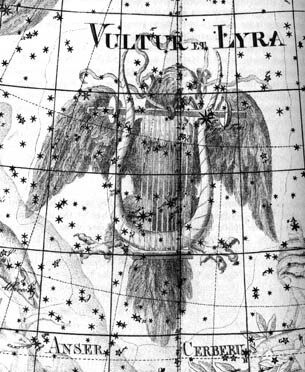 The constellations associated with these stars are as follows ... the pink parallelogram marks Lyra, the large aqua cross marks Cygnus, The Swan and the blue lines form Aquilla, The Eagle. Vega stands just at the western edge of the summer Milky Way. Look Up, almost straight up, at the zenith to find Vega, the prima donna of this triangular trio. Sparkling blue-white Vega is in the constellation Lyra, the Lyre or Harp. south of Vega toward Altair. its close proximity to the Earth at only 25 light years away, its brightness, many times that of our Sun, which comes from an inherent luminosity not just from its closeness, its color and apparent brightness which make it a basic standard against which all other stars are ultimately compared, and its relationship to the pole star. 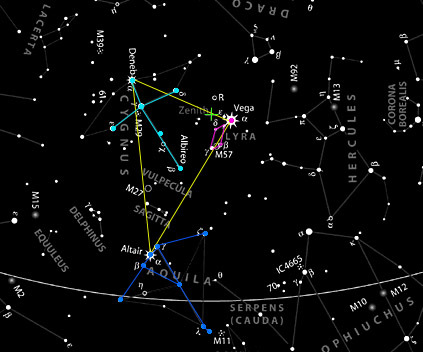 Vega, the brightest star in the Summer Triangle, will be the "North Star" in about 12,000 years, instead of present-day Polaris. This change in pole stars is caused by precession, the very slow (26,000-year cycle) wobble of the Earth's rotational axis. The illustration above shows the apparent path of the pole with corresponding years labeled for the present cycle. An esoteric point of interest is Vega's relationship to the star Sirius. Ponder on this ... when Vega is directly overhead at the Zenith (about 3 hours after an August sunset) Sirius, the God Star and the brightest star, is under our feet! From our head to our toes we are heavenly stimulated in Leo. Another Vega connection to Sirius lies in the Japanese myth. A peasant boy, the star Altair, is allowed to cross the River of Heaven (Milky Way) to unite with the princess and his lover, the star Vega. When does this occur? ... on the seventh day of the seventh month. This is the time when our physical Sun is conjunct our spiritual Sun, Sirius. During this time many celebrate freedom and liberation. Lyra was frequently visualized as an eagle or vulture as well as a lyre or harp; both are shown on this illustration from the Uranographia of Johann Bode. Near the tip of the vulture's beak is the bright star Vega. Vega is a link between Heaven and Earth, even its name of Arabic origins means "swooping eagle." Vega is a bird that flies down to the Earth. The lyre or harp is also a symbol of this link between Heaven and Earth. The lyre or harp was invented by Mercury, the messenger of the gods, and was owned by Apollo's son, Orpheus. The song of Orpheus and the music of his harp had the power to tame all creatures. He is known as the Bringer of Culture and the Father of Mysticism. Orpheus, the one who plays the lyre, has been compared to Christ because of his violent death, journey into the underworld and the school of mysteries which he founded. Look Up to the great Summer Triangle and Vega ... take a moment to hear the heavenly harp as it sounds forth its universal chord! The Summer Birds ... Near Vega, also known as the "Swooping Eagle," there are two other birds that are linked to the Summer Triangle. Deneb, the eastern point of this triangle, is in the constellation Cygnus the Swan and Altair, the southern point of the triangle, is in the constellation Aquila the Eagle. As the summer unfolds, these three birds fly the stream of the Milky Way, where it is said that souls experience true unity and hold communion with the Cosmic Christ. Allow your spirit to fly to new heights as you Look Up through the Summer Triangle to the Milky Way. Deneb, which means tail, is the tail of its constellation, Cygnus the Swan. The swan's long neck and beak or eye, the star Albireo, point south as it wings its way between Vega and Altair. Vega gives way to The Swan which traverses the zenith during the Virgo nights. 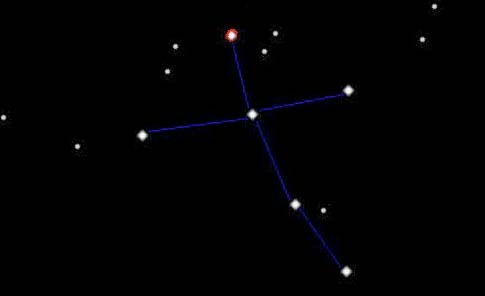 This constellation resembles an old fashioned paper kite or a cross. The Swan is also known as the Northern Cross and around Christmas it can be seen upright on the western horizon. The keystar and tail star of "The Swan" is Deneb. It is marked in the above image with a red star. The wings are represented by the horizontal line and the swan's long neck stretches below ending with the beak or eye star, Albireo. The Swan has the quality of transformation and resurrection associated with it. Cygnus, a Trojan hero killed by Achilles, was transformed into a swan by his father the sea god, Poseidon. When Achilles stripped him of his armor, he was gone! Zeus also transformed Cygnus into a heavenly swan after taking pity on him when he died of grief being unable to retrieve the dead body of his friend from the river. Cygnus looked like a swan diving into the water in vain attempts. Folk tales tell of a swan maiden, a goddess-like creature, who could assume human form. A young man who loses his swan maiden also loses his innocence and passes into maturity. The Swan is also known to transform death with the beautiful "swan song." Vega is associated with the Christ and transformational music. We now see that Cygnus has similar themes. Just as the three stars which make up the Summer Triangle are extremely different in true brightness and distance from us, they also vary greatly in size. This graphic shows a dramatic comparison of the sizes of these stars with our own Sun. Note the giant size of Deneb! Altair, which means the flying one, is the head of Aquila the Eagle. Aquila sets in the west tail first and soars north parallel to Cygnus, who flies south and sets beak first. 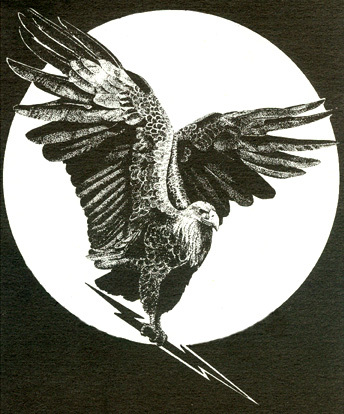 Aquila is known as the royal eagle of Jupiter, whose talons carry mighty thunderbolts. Aquila is also the bird of Zeus, who ran errands for this king of the gods between heaven and earth ... a messenger from heaven transforming souls and leading them to immortality, similar to Vega and Deneb. The Eagle, like the Lyre and the Swan, also sounds a note, the note of the thunderbolt! This bird of Zeus abducted Ganymede (known as Aquarius the air sign) and carried him through the air to the higher realms of Mount Olympus to be the cup bearer of the gods. the nature of air and spirit. The heavenly trinity is complete, the notes sound, transformations occur and a holy communion results. You're invited to partake and travel the path of the gods through the gateway of the night sky summer triangle into the cosmic river of divine unity. All you have to do is Look Up and stay awake, while it's dark in your world! For additional cosmological and spiritual insights on the Summer Triangle visit SouledOut.org's Highlights.